"Serves 2 rolls per person. 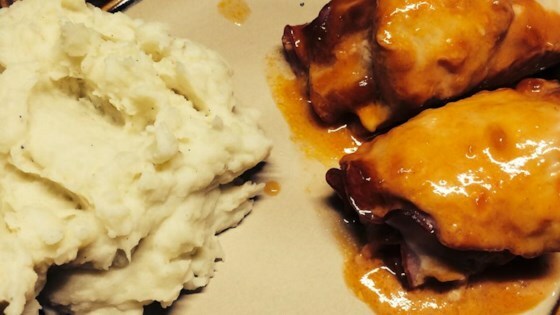 Smoky meaty rolls of goodness!" Trim the fat from the smoked meat, place a piece on each chicken breast slice and roll. Fasten with toothpicks and place seam side down in a 9x13 inch baking dish. Mix together ketchup, mayonnaise and jam. Pour mixture over chicken and bake uncovered in the preheated oven for 20 to 25 minutes. Chicken Neptune & Kiev deliciously married! This was...interesting. Not bad, everyone ate it, but it was a little weird. I don't think I'll make it again. I'd also recommend BBQ sauce instead of ketchup.